When this job was brought to us, it was in the form of an already created epub file. However, this file didn’t pass its basic validation and many errors in the code needed to be fixed up by us. We then created the mobi file from this and went on to aggregate on all major vendors except Apple, as the code created from this other publisher was not compatible with the iBookstore and we didn’t have the time or budget to fix it. The Launceston Film Society prides itself on being the largest film society in Australia with a membership in excess of 1500 people. Its beginnings though were a little less ostentatious. 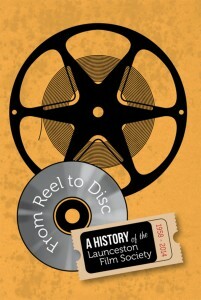 It is this story that has been researched and written by Launceston historian Dr Thomas Gunn in the new book From Reel to Disc. Commissioned by the Film Society, Dr Gunn soon encountered a major stumbling point: no-one seemed to know when the Society actually started. It was fortunate that many years ago a member of the committee had given the original minute book to the Launceston Library. This was to provide the foundation for the initial research which was then carefully developed through oral histories and further research. The idea of a film society was not new; a number existed at various times in Launceston. It was the Launceston Adult Education Film Society, established in 1958, that was to continue and exists today as the Launceston Film Society. The Society has survived a number of challenges and changes in our world: the introduction of television, of coloured television and of the video recorder. But only just. These were innovations that were the death knell of many film societies world-wide and indeed threatened the film and cinema industry itself. It is not exactly known how many films have been shown by the Society. In the early days it was one a month. Today they show over 40 films a year, each with four screenings at Village Cinemas. The films shown originate from around the globe and have covered numerous subjects and many genres.